After just receiving this plaid top last week from Yoins, I've already worn it twice. Once to work with black jeans and pink flats, and another day with jeans (although I switched the heels for flats when running around with my daughter). I have been wanting a white plaid top for a while and this tunic was perfect. Plaid is always big for fall, but a white and black plaid is especially versatile. Classic black and white prints pair effortlessly with other colors and prints. I love having options! This time I added color with fun jewelry. I was impressed with the real stone pendant and the earrings, while resin, are very lightweight. 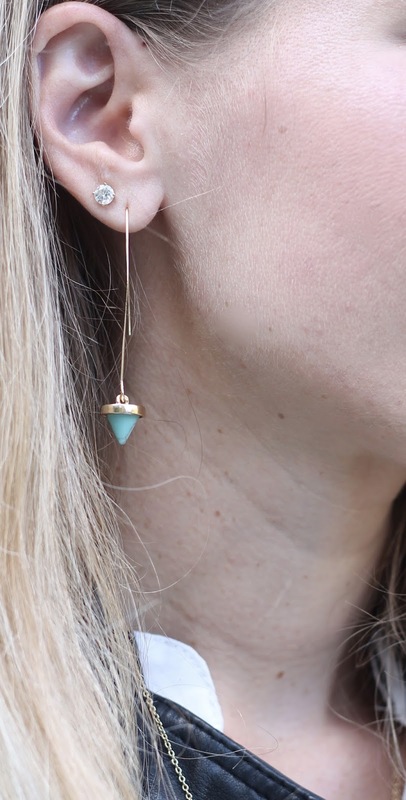 They make a statement without making your ear feel like it's going to fall off! I also wanted to let you all know there is free shipping today only at SheIn! If you have been eyeing some items or want a few new things for fall, now is the time! I recently received my criss cross top and distressed jeans from them! I so love this look, the leather jacket is perfect with it. This is such a chic look! I love your top and the leather jacket gives this outfit a nice edge! Love this fun and rocker-chic look! Date night approved! Those earrings are stunning too - what a nice design! I've never seen anything like them before. Love the plaid top paired with this cool leather jacket! The jewel are a nice touch too. Love this edgy look on you!! Your top is so pretty, and loving your moto jacket! Great top! I can see it being very versatile which I always love. You styled it so well with jeans and your jacket. You find the neatest things Laura!! And i can totally see why that shirt is a favorite---it'll go with everything! I just pinned this look, I love it SO much! That jacket with the simple plaid top is so, so perfect! I really love that huge agate necklace, too!! A leather jacket, jeans, and heels- that's my kinda outfit! Digging this, doll! That is such a pretty and versatile shirt! I can't wait to see other ways you wear it. What a great windowpane plaid - that will transition so well into fall and winter. Such a great outfit! Love the window pane pattern blouse. You look great!!! You're just adorable! I love the blouse! 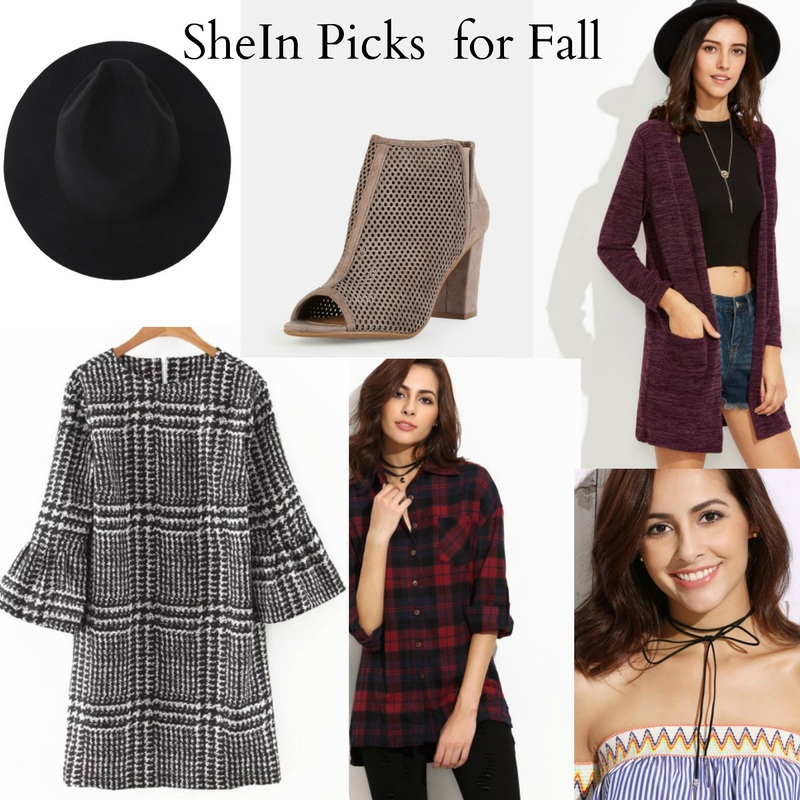 And I love the SheIn picks! The black and white plaid looks great. The plaid dress you linked looks interesting too. Thanks for linking up to the Top of the World Style linkup party. Great wood watch! LOVE this outfit! White w/ black plaid is one of my favorites. 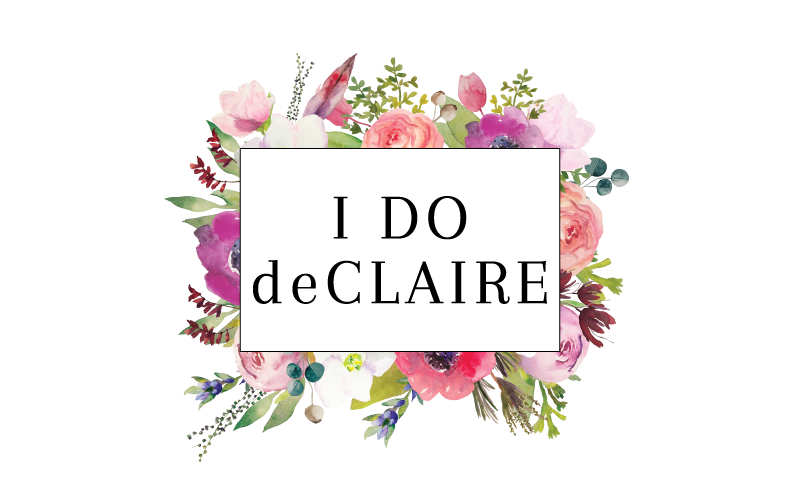 I think it's so chic. And it's so fun to see you in Express jeans. :) They fit you so well! Okay, I think this is my favourite outfit of all your outfits. yup. Love it. Such an amazing look! I have a similar top, I will have to case this look sometime! Such a great look Lura! 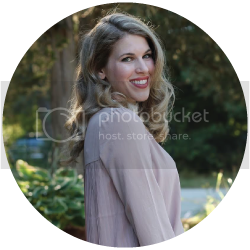 This shirt is so stylish and versatile, love how you styled it and crazy about these chic earrings! Perfect transition to fall outfit, Laura! And you know I always love a Jord watch! Thanks so much for linking up with Fun Fashion Friday and hope your Saturday is fun and fashionable too!